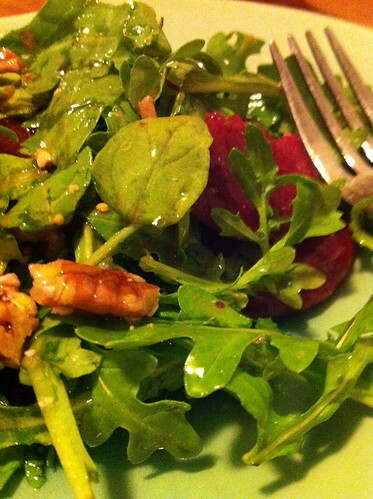 I used canned beets (I buy the whole ones, then do a quick slice), bagged arugula and some pecans that I crushed up in my hands. Then I tossed in a quick vinaigrette (with red wine vinegar, in this case) and sprinkle with a little blue cheese. Voila! As an added bonus, it’s nice to see some greenery in the middle of a Chicago winter. But wait, you say, this isn’t filling enough for dinner! I suggest a quick grilled cheese to accompany this salad. My preferred method is farmer’s market bread, a blend of whatever cheeses we have in the house, and a schmear of mustard). Follow that with some fruit for dessert, or maybe a little yogurt-granola-fruit parfait. DONE. Dinner in 10 minutes!